A paper organizer for my craft paper supplies (vintage stuff, like old greeting cards, tags, labels, etc.) was not high on my list of “priority projects”. But, I spotted a vintage photo album at the thrift store the other day, and, well, fate had another plan in mind. It was heavy and in terrific condition, but it was the photo pages that really sold me! Instead of sticky pages covered in plastic film, this vintage photo album boasted heavy duty pockets with large cellophane windows. And I thought, “Gosh…this would be FABULOUS for my collection of paper ephemera. Vintage seed packets…labels…old greeting cards, etc.”. Plus, it had these great Baby Book-type pages up front for filling out family information. I was smitten! So I placed it in my cart and brought it home to upcycle into a craft organizer for my vintage paper “stuffs” and scrapbooking supplies. This post contains affiliate links for your crafting convenience. Of course, I could have just brought home the photo album, removed the price tags, and start organizing my craft paper supplies right away. But what’s the fun in that? So, I grabbed some bright aqua paint, a brush, and began to give it a makeover. Because I had already started stenciling some craft supply organizers earlier this year, I used the same stencil so that it coordinated nicely. All I did was center it on my vintage photo album, and used painter’s tape to hold it in place. And yes, just ignore those pretty colors still on the stencil. I do *some* stencil cleaning after a project, but I don’t spend a lot of time on it or worry about removing every last bit. 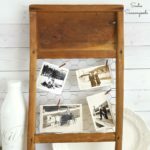 To keep it clean and simple, I used black craft paint (and my stencil brushes from this online shop) to decorate my vintage photo album turned paper organizer! And that was it…now I just need to fill each pocket with related craft paper and paper ephemera, such as my vintage seed packets. Something that I plan to do but hadn’t finished by the time this blog post was published was add labels. Once I’ve organized my craft paper ephemera into the vintage photo album, I’ll create labels for each page to keep things more organized. 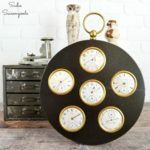 This vintage photo album is seriously a game changer for my scrapbooking supplies! It’ll keep everything flat and away from sunlight, AND I can see everything through the cellophane pockets. No more digging through a box or bin. Curious where I find much of my vintage paper supplies? Check out Crafty Lisa’s Vintage on Instagram – she’s my main supplier! And now my paper organizer will match the other craft organizers in my craft room! Well, maybe not match, but will coordinate nicely…which I actually prefer over too much matchy-matchy. As a bonus to celebrate Spring, I’m doing one of my famous Giveaways of Craft Junk & Supplies from my stash! You must be a subscriber to enter, but there are lots of ways to get extra entries. Please see below for information. Such a neat idea and i love color! Yes!!! Also a great idea, Kristie! Great project! As a rubber stamper, I have used GW $1 notebook binders with acetate papers and photo pages (5 pockets on a page) to store my flat rubber stamps and embellishments. Organization is such a good thing. Unfortunately, I bet you thought of umpteem projects while you were organizing these, didn’t you?!?! Ha!! Other way around, more like it- I’m working on another project with some of my paper goodies and realized how unorganized they were! Oh my goodness! What a great idea, it turned out great! Thanks, lady! You can never have too much organization, right? WoW! I’m sooooo excited to do this project! I am behind on projects, (spring plants/salsa garden) so I pinned, made notes, put all supplies in a project basket. Labeled so i know exactly what i want to do. Thank you for sharing and giving so much detail. Love your ideas, creativity and truly inspiring! What a find, I don’t think I have ever seen one like this with the pocket pages. I never would of thought to paint and stencil to bring it up to date, and look so pretty!! Love this AND its one of my fav colors!